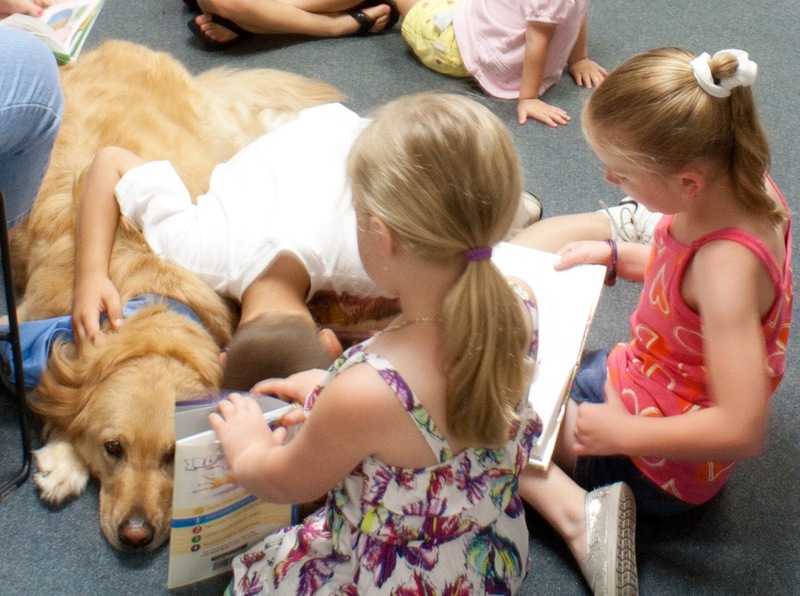 Read to me about the golden retrievers, says Micron. Fly Guy vs. the Flyswatter? Really?, I say. I'm thinking this next question is going to be kinda sensitive, but yeah, here goes. Um, does Fly Guy win? I ask. Yeah, says our young reader, totally throwing the spoiler right out there. She turns another page in her book like this was nothing. Well, sure I asked for it, I guess. The spoiler that is. So, I say. Because I need to know more about this Fly Guy person. Is that a good thing then? I mean, having flies in the house that talk to people is ok? She doesn't look up; just turns yet another page and shifts her book to show Micron a picture. I don't know, she says. Ugh, this is vexing. I know it's been a while since I've immersed myself into children's literature, but really. We want the flies to win now? Growing up on the farm as kids, we actually held time trials on who could swat the most of these pestilent creatures before we sat down to dinner. If one was still able to buzz after a swat, those were only granted a half point. You know, the same basic rules that most families use. Not sure how to get my head around this Fly Guy series by Tedd Arnold about a boy named Buzz and his big eyed pet. With titles like There's a Fly Guy in my Soup and There Was an Old Lady Who Swallowed Fly Guy, my gray matter is dredging up some not so happy childhood memories. But I don't want to get all judgey until I have a chance to read about this thing. Trying to keep an open mind here. It's a popular series with the kids, I find. And in spite of the subject matter, the books are clever and funny with a format intended as a smooth transition to chapter books. Honestly, so long as kids are inspired to pick up a book to read for fun, I'll support just about any topic in children's literature. Except maybe spiders. No, definitely eight legged freaky things are out. Everyone has their limits and I have to put my foot down on spiders. Real hard, too. Until you hear the harmonic symphony of the squish and muffled shriek. Nasty little buggers. for a couple more, I think. 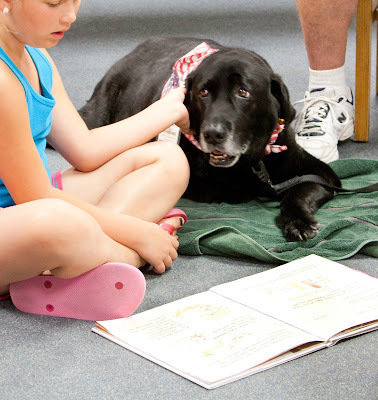 Micron and his canine peers with Miami Valley Pet Therapy Association have finished their work with the summer Paws to Read program at our local branch of the Dayton Metro Library. For the last eight weeks, these awesome dogs have listened to stories about everything from talking aardvarks to the history of fire trucks. Some weeks we enjoyed as many as forty kids wanting to read to the dogs and it wasn't unusual to see Micron resting with his eyes closed as he took in each story as shared by the five kids sitting around him. 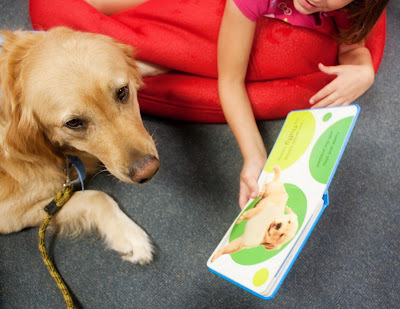 * And it was the same for the other Paws to Read dogs, too. Good thing these are canines highly trained to listen well. Although, I gotta say that Micron and his friends seem to be just plain naturals with their mad skills of engaging young readers. This lot acted like they were born to do this very thing. Fulfilling destinies here on the library carpet. Because if there's one single thing that Micron is proficient at, it would be tamping down carpet fibers for long periods of time. If the dog is in the room, rest assured the flooring is not going to go awry on his watch. The Paws to Read library program is intended to encourage young readers to enjoy a good book among friendly canines. 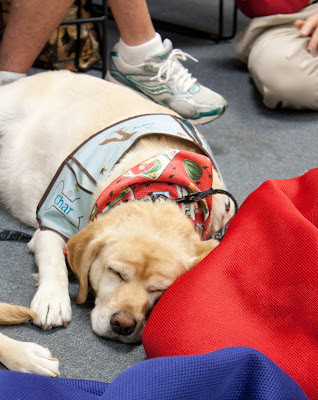 Unlike those of us who are rather judgmental about talking flies, these dogs really don't have any concerns over plot lines or even individual reading styles of the narrators. 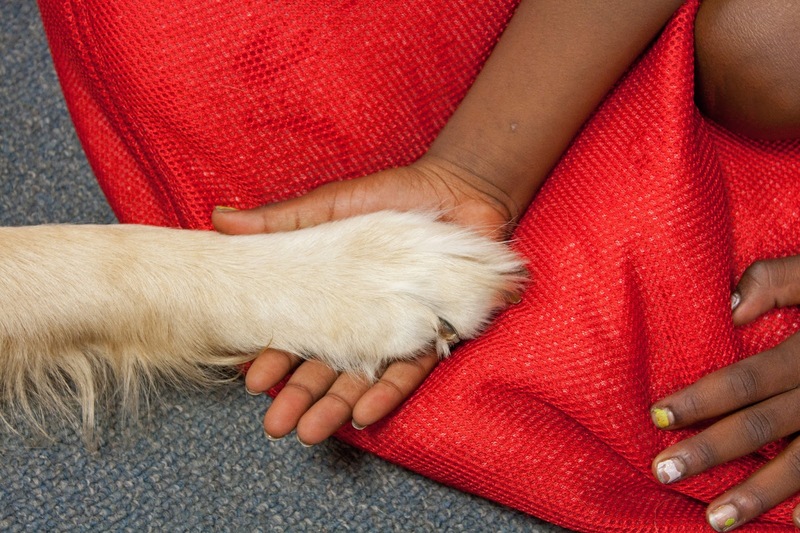 It's a comfortable, welcoming environment with all the happy hormones that pet therapy dogs bring with them when they enter a room. 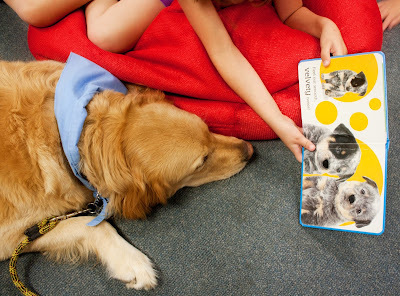 Paws to Read, not paws that read -- just to be clear on this. We stop here to make this all about me for a minute. 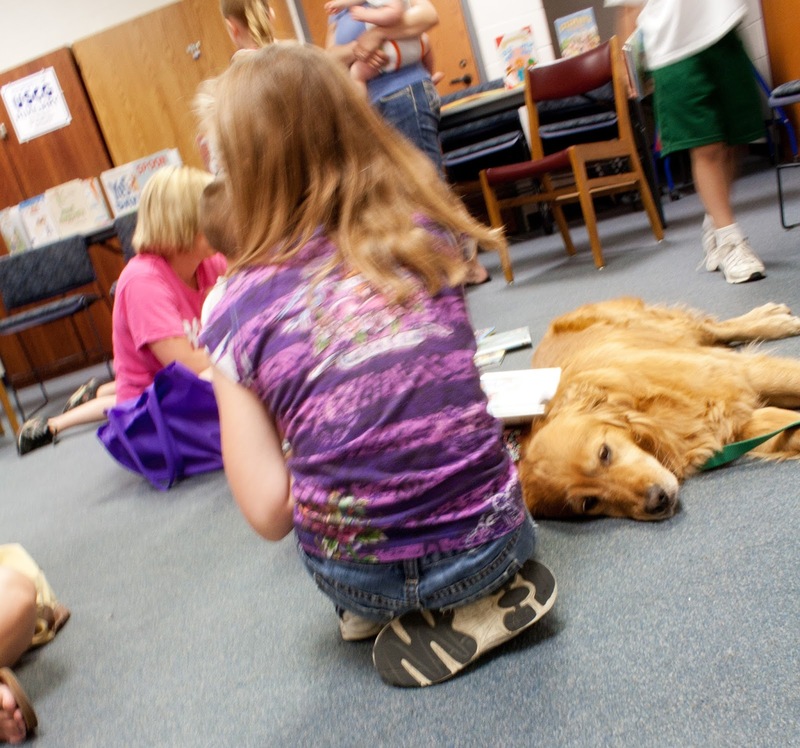 I have to tell you that there's some sort of nirvanical** feeling that goes with being in the same space as dogs and children reading on purpose because they want to. Just some things that make me very happy with the world at large. It gives me some hope for the future, it does. Well done, you parents of dog-loving children. You are awesome. the kids still need him, he says. No, no, keep reading. I'm listening, says Char. listen to his insect misadventures all day. *Hey, I learned something new in all this reading stuff. We are no longer to refer to sitting on the floor with legs crossed as sitting Indian style. No, now it's criss-cross applesauce. Huh, who knew? **Right, I made that word up. So, it's not misspelled, thank you anyway, Spell Checker program. It fits nicely though, right? I honestly can't come up with a better word to use there. I also recently learned about the "criss cross applesauce" style of sitting. My niece said it and I had no idea what she was talking about.